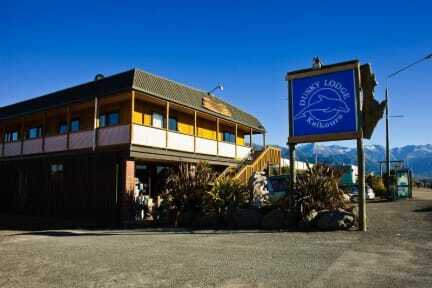 Dusky Lodge & Backpackers is situated on Beach road, Kaikoura. 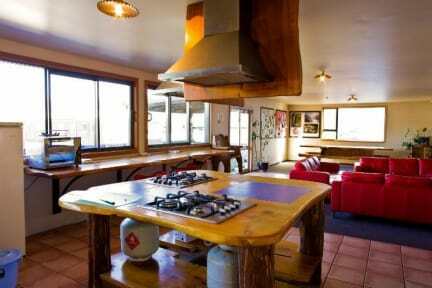 We are the largest hostel in Kaikoura catering for budget travellers and groups. We offer a clean homely environment with bunk rooms, doubles, twins, triples, en-suite and family rooms with heaters in all rooms. Bed linen and pillows are provided. There are 3 large kitchen’s fully equipped as well as BBQ’s on the decks free to use. FREE unlimited wifi is available throughout the hostel for all our guests to use and free calls throughout NZ. Guest computers are available and large screen televisions for rainy days. Log burners are situated throughout the building for those cold winter evenings. The hostel is only 5 minute walk to the town centre, and across the road from Whale Watchers. The best bakery in town is situated right beside us and grocery stores only minutes away. Dusky Lodge & Backpackers is a great place to relax, unwind and take in the great views and spectacular sunsets from our extensive decks. Our friendly team can help book tours or give you advice on what to do while you are with us. We hope to see you soon! Amazing hostel, only bad thing is there's only one pretty small kitchen for a lot of people. Other than that - perfect. Amazingly kind staff! We had an incident with our car just in front of the hostel and they did everything within their means to help us sort it out. We stayed here for a night on route from Nelson to Christchurch. We enjoyed our stay, very spacious hostel with clean facilities, large kitchen and comfortable beds. A bit away from the town centre but not a far walk. Really open space and relaxed atmosphere. Lots of room. WiFi was poor but I think there’re sorting this issue. Overall definitely recommend. Only stayed for a night but everything was pleasant. Comfy beds and clean bathrooms. Outside eating area was really nice to watch the sunset from. About a 15min walk from the town centre, and a 10min walk to supermarket in the other direction. kitchen was really dirty. no atmosphere. the showers got cleaned when everyone wanted to shower. female showers were closed and under construction. not enough bathrooms and toilets. This hostel hosts multiple ‘Kiwi experience’ buses a day, meaning dozens of guests daily. It’s a huge hostel, with plenty of rooms and space though lacking enough kitchens. This causes a serious H&S problem. There’s not enough cooking space, hobs aren’t working properly, not enough tea towels; this makes the kitchens extremely dirty, there aren’t enough staff to clean, so you’ll find the kitchens looking like a battlefield until 11am (from the night before!). Salmonella haven.